Charge, sync, secure and organize all your mobile devices in one place. These charging stations are a great way to store and keep track of mobile devices in school and office settings. 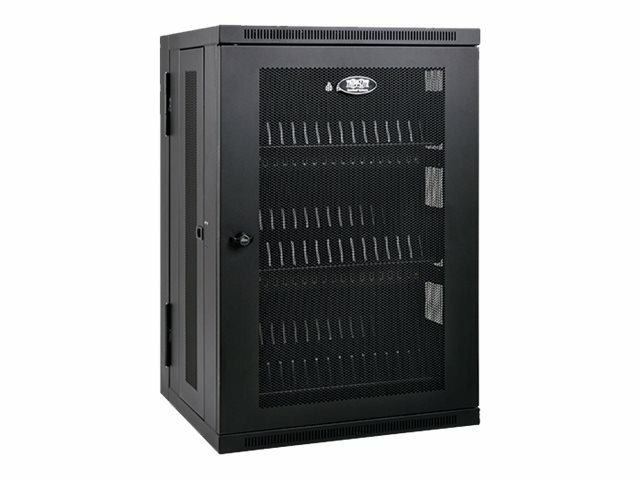 They have locking steel cabinets and can be wall mounted or placed on a desk or floor. iPad/tablet charging stations secure 48 tablets, including iPad and Android models. They provide syncing and high-speed USB charging (up to 2.4 amps per port). Max weight capacity of 250 pounds. Recommended for iPad, Android, Surface and Kindle tablets. Also charges mobile phones and other USB devices. Detachable 10 ft. AC input cord with NEMA 5-15P plug. USB sync uplink port connects to host computer for wired syncing. Supports simultaneous syncing and charging (up to 1.5A per port during wired syncing). Sturdy steel construction and powder-coated finish promote long-term durability. Doors lock with included keys to help prevent device theft, damage or tampering. Flow-through ventilation helps prevent devices from overheating. Coated shelves shield devices from scratches and scuffs. Supports mounting to wall, desk, table, counter or floor. Door opens 180 degrees for improved device and service access. Removable dividers accommodate thicker devices. Firmware upgrade port for future updates.